It’s no big surprise that CBS is considering making a change to its Monday night line-up. Though Worst Week was hailed by critics as the best new sitcom of the season (not that there’s much competition for that title), the public doesn’t agree. Worst Week debuted on September 22nd on CBS. 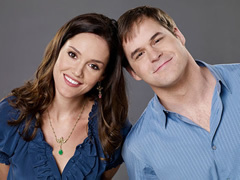 The quirky, single-camera sitcom follows unlucky Sam (Kyle Bornheimer) as he tries to make a good impression on the family of his pregnant fiancé. The series, a remake of a UK sitcom, also stars Erinn Hayes (The Winner), Nancy Lenehan (Grace Under Fire), and Kurtwood Smith (That ’70s Show). The sitcom premiered in the plum spot following CBS’ most-watched sitcom, Two and a Half Men. Unfortunately, Week doesn’t seem to be a good fit. The show debuted to 10.87 million viewers and a 3.8/8 rating/share in the 18-49 demographic. It was nearly tied for second place in viewers (with the second half hour of NBC’s declining Heroes) but was significantly lower in the important demographic. Should Worst Week be cancelled? A bigger issue is that the sitcom lost a third of lead-in Men’s audience. As the weeks have progressed, Week’s ratings have improved a bit but it continues to lose over 30% from its lead-in. Last season, both The New Adventures of Old Christine and Rules of Engagement retained a bigger percentage of Men’s viewers and the network was barely satisfied with them. Despite the network’s order for two additional Week scripts, it’s looking doubtful that Week will air throughout the November sweeps period. Next Monday’s episode of Week was scheduled to be a repeat and CBS has replaced it with a rerun of the Wednesday night comedy Gary Unmarried. The freshman Jay Mohr sitcom just had its best night to date and the Tiffany network wants to see how well it will perform in Week’s spot. Gary is similar in tone to Men and will likely retain more of its audience. For now, Week is scheduled to return on November 3rd, a week into the sweeps month. If Gary performs well, it seems likely that the sitcom could permanently bump Week from the timeslot. Will Worst Week return to Monday nights, shift to Wednesdays, go on hiatus, or disappear altogether? Any way you look at it, the show’s future doesn’t look good. Stay tuned!